Now you can be ready for a Minecraft party as there now is a Minecraft party supplies set that has everything you need to get the party started. 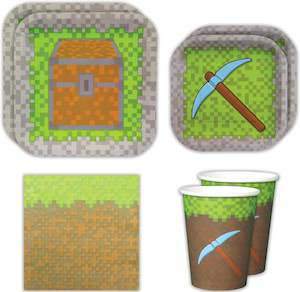 The party supplies pack includes 16 dinner plates with a chest on it, 16 desert plates with a pickaxe on it, 20 paper napkins that look like a block of dirt, and 16 cups with a pickaxe on it. A fun set like this is all you need for a birthday party or maybe a Minecraft gaming marathon with friends. The nice thing of this set is that you have everything you need so come get your Minecraft Party Supplies.